Derek Jeter isn't undergoing a sexual reassignment surgery, as the Yankees' Facebook account might have indicated late last night. And the Chicago White Sox don't really believe Obama is a #Muslim President. The status updates were a result of a hack of various Major League Baseball Facebook accounts. In addition to the Yankees and the White Socks, accounts from the Chicago Cubs, the Miami Marlins and the San Francisco Giants were hacked. "We apologize for anything inappropriate that appeared on the Yankees' Facebook page. 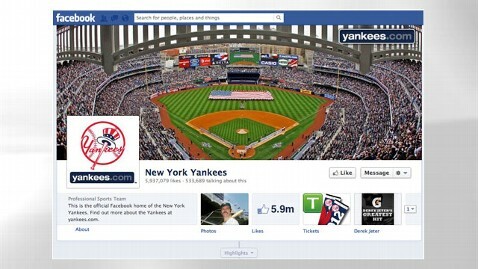 The Yankees' Facebook page is controlled by Major League Baseball Advanced Media. They are looking into the false post in cooperation with Facebook," the Yankees' stated via its Facebook page this morning. Other teams also apologized on their feeds. Both the MLB and Facebook are currently looking into the attack. "Recently, several pages made unauthorized posts as a result of actions from a single rogue administrator of these pages," a Facebook spokesperson told ABC News. "Our team responded quickly and worked with our partners to eliminate the inappropriate messages caused by this attack. This was a unique, isolated incident and we are always working to improve our systems to better protect our users and their data." Social media hacking issues have become a more prominent issue this summer. Yahoo and LinkedIn passwords were breached in June and July. It is unclear how the hacker in this MLB / Facebook issue was able to gain control of the account.